Bright sunny days make for delightful garden visiting but for an amateur photographer like me, inexpertly using a smartphone camera, the exaggerated contrast between sun and shade is quite a challenge. So on a few recent occasions I have searched out planting that deliberately accentuates shadows for decorative effect and taken some rather neat photographs. Of course, in the UK only a perennial optimist would base a planting scheme solely on the contrast between sun and shade, but once you have tuned into the possibilities then you can choose and tweak planting to add this extra dimension to your existing borders. And the good news is that this might well mean thinning out rather than finding space to add in. 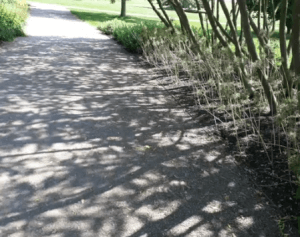 When you start to think about ‘shadow play’ planting, the key requirement becomes quite clear – space. In the same way that good page or screen design relies as much on the blank spaces as the text and pictures, so you need space around the plants to create clean, shadows with crisp outlines. 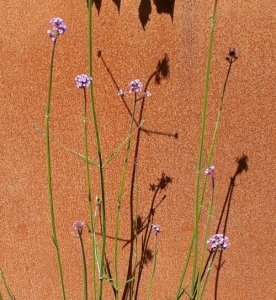 Here is an example from the RHS 2017 Hampton Court Flower Show in the Brownfield – Metamorphosis garden of a single plant of that airy stalwart Verbena bonariensis. I love the contrast of both the purple flowers and the dark silhouette against the rusted steel screen. The whole moment would be lost if there were dense planting. Definitely a case of Less is More. On a larger scale we often select small trees and shrubs for their architectural shape, even removing lower branches to emphasise the sculptural quality of a multi-stem specimen. An example taken further is this whole grove at RHS Hyde Hall where the clear stems and high, flat canopy cast an intricate shadow network onto the path, with the structural, sputnik seed heads of tall Allium as underplanting. This effect too only works because there is no ‘fluff’ and plenty of empty space. Maybe next time that you are tempted to fill in every last space for an all-over planting scheme, pause for a moment to see where the sun is coming from and whether you could add some shadow play into your garden too.